The little town of St. Goar lies on the left bank of the Rhine, and its name derived from a hermit with the same name who lived here in the 6th century. He was worshipped as a saint even when he was still alive. In 765 one of the Germany's oldest monasteries was erected where Goar's hermitage was placed, and today you will find a monastery church (dating from the 11th century) with its Romanesque crypt built on the foundation walls of this old monastery. The Gothic frescos in the church interior are part of the most complex cycles of late medieval painting in the region. St. Goar is towered over by the Rheinfels fortress, one of the most massive fortifications on the Rhine. The fairy-tale like scenery of this fortress on a rock spur served as a theme for many drawings, engravings, water colourings and paintings. Amongst the artists are famous names such as Albrecht Dürer with a drawing from 1521, and William Turner with a romantically themed painting from 1817. Even though only one third of the original fortification exists today, the visible remains are still very impressive. The earliest parts of the Kemburg date back to 1245, and were erected by the Earl of Katzenelnbogen as parts of a perfect blockade, serving as a taxation point for the Rhine shipping. In subsequent centuries the owners expanded the building systematically. It only ended in 1794, when French troops conquered it and destroyed all military constructions including the fortress. 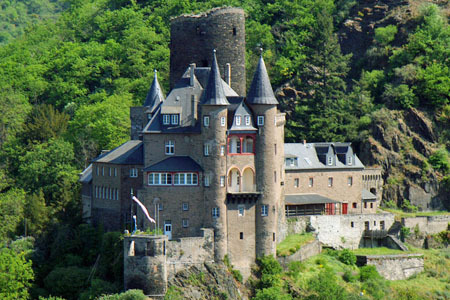 Today Rheinfels fortress is owned by the city of St. Goar, and comprises a hotel, a restaurant, and the local history museum. A most rewarding hiking path leads from Rheinfels fortress to the plateau of Biebernheim village, and from there to the observation point located directly on the banks of the deeply incised Rhine valley. The best view of the rock of Loreley can be had from here. This rock was immortalized in the ballad by Heinrich Heine about the beautiful witch Loreley who sat upon the rock combing her golden hair with a golden comb. She brought death and destruction to the sailors who watched her and did not pay attention to the rocky reefs (Ley=rock). A few kilometres downstream from the Loreley rock, we find the little town of St. Goarshausen with its Katzenelnbogen fortress lying across the river but connected to it by a ferry. The plateaux above St. Goarshausen were already populated in Celtic times. For instance, there is a rocky plateau, which falls down steeply towards three sides, and is only connected to the rear plateaux by a narrow land connection. On this little rocky plateau there once was a Celtic plateau settlement with fortification that was built in the 6th century B.C., and defended by a massive fortification wall. The preserved parts of the wall and the moat continue to impress visitors today, mostly due to their very secluded location. This story, set to music by Friedrich Silcher, has made Loreley the symbol for the romantic Rhine. Near St. Goar is the Rheinfels fortress, a part of a perfect blockade of the flow of the Rhine for the purpose of tax collecting. Another part of the blockade was Neu-Katzenelnbogen on the same side of the river as St. Goarshausen and locally known as 'Burg Katz' (Cat Castle). It was built in the 14th century by Earl Johann III von Katzenelnbogen as a counterpart to the nearby Archbishop of Trier's Peterseck castle, which was immediately was nicknamed "Mouse Castle". The illustration shows "Cat Castle".